A rainy Thursday morning gave way to a sunny afternoon as golfers packed Riverside Golf Course in Cambridge Springs for an outing of golf benefiting the Gertrude A. Barber Foundation. 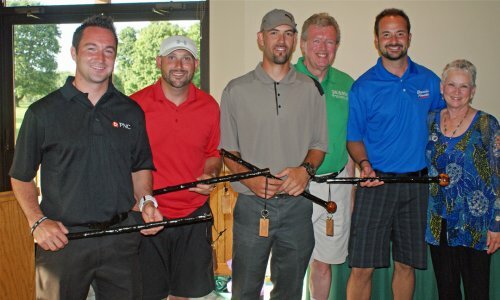 The Bianci Honda team, which consisted of John Potter, Dave Spitzer, Cory Smith and Jason Porreco, won the tournament while displaying their best drives and putts. All the foursomes participating in the tournament had a great time and competed closely. The day was capped by honoring Bev DiCarlo, the Shillelagh Woman of the Year. DiCarlo completed her "Race with Grammy" mission, which was to run half-marathons in all 50 states by 2014 on her 70th birthday. Her inspiration came from her grandson, Aidan, who was diagnosed with autism. DiCarlo was able to raise awareness for autism and funds for the Gertrude A. Barber Foundation. Congratulations to Bev DiCarlo, the Bianci Honda team, and the rest of our partcipants in the 2014 Shillelagh Golf Tournament. It was a wonderful time and we look forward to seeing you all next year!